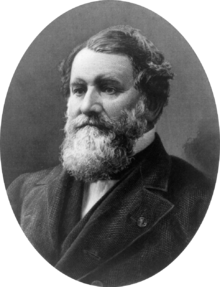 As we help ourselves, we might send bounteous birthday greetings to Cyrus Hall McCormick; he was born on this date in 1809. Widely credited as the inventor of the first mechanical reaper, he was in fact just one of several contributing to its development. His more singular achievement as a creator was his success in the development of a modern company, with manufacturing, marketing, and a sales force to market his products. His McCormick Harvesting Machine Company became part of the International Harvester Company in 1902.